The Canon IXUS 1000 HS is a largely successful attempt to marry the style of the IXUS range with a big zoom lens, but the 36mm not-so-wide-angle setting, poor battery life, a lack of refinement in the handling department and the high price tag detract from the overall experience. The 10x zoom lens is a real boon to your creativity, especially given the camera's diminutive size and weight, providing enough reach to take close-up action shots despite being able to easily fit inside a trouser pocket. Less impressive though is the 36mm wide-angle focal length, which really limits the kind of landscape and group photo shots that you can take, and doesn't compare well to the super-wide-angle lenses of some key rivals. Featuring a sensible 10 megapixel back-illuminated sensor, the IXUS 1000 HS was always going to deliver the goods in terms of image quality. Noise doesn't rear its ugly head until ISO 800, with even the fastest 3200 setting proving usable, something that you can't say about too many compact cameras, and chromatic aberrations are also well controlled. Only some slight softness in the corners spoils an otherwise stellar performance. Full 1080p HD movies complete with stereo sound and (rather slow) use of the 10x zoom are the icing on the cake. Casual users are more than catered for by the wealth of hand-holding technologies on offer, but the IXUS 1000 HS's lack of external controls does mean that some things are more difficult to access than they really should be. An over-reliance on the Function and Main menus slows down the camera's operation, something that beginner's won't mind so much, but which will particularly irk more serious snappers. Nobody will like the very short 150-shot battery life, with two batteries required for more than half a day's shooting. The IXUS 1000 HS doesn't really live up to the HighSpeed part of its name. While 3.7fps at full resolution is pretty fast in comparison with most compacts, there are some Sony models that can shoot at 10fps at full resolution, which rather dwarves the IXUS 300's headline speed of 8.8fps at a paltry 2.5 megapixels. Likewise 240fps movies played back at 30fps are a novel feature, but they're very low resolution and the specification is again bettered by several Casio models. 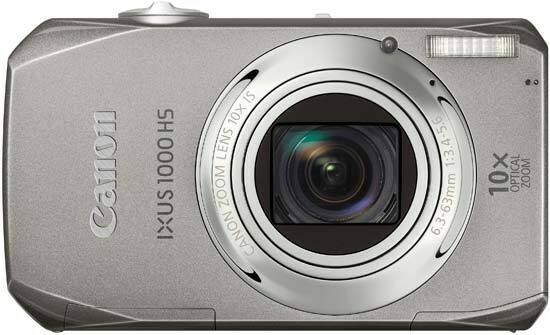 The final problem for the Canon IXUS 1000 HS is that £349 / $350 / €419 price-tag. A little more money will buy you the PowerShot S95, PowerShot G12 or even an entry-level DSLR like the EOS 1000D, while a little less gives you the choice of several better-specced rival models. The IXUS 1000 HS is an appealing blend of form and function that also takes great pictures and movies, but it has a few too many flaws to recommend more strongly.